Philips OnSite Business Package: Battery and pads come pre-installed. 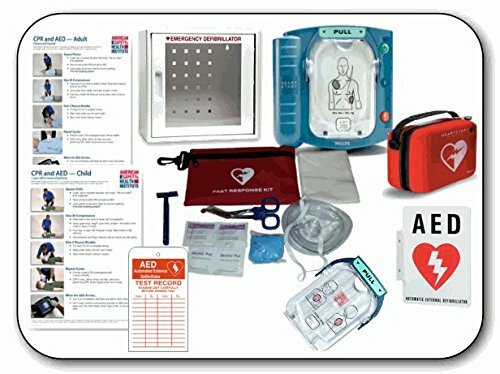 Included: standard carry case, basic AED cabinet, premium AED response kit, AED wall sign, inspection tag, window decal, adult & Child CPR/AED poster. Studies show that even untrained people can respond to Sudden Cardiac Arrest using the Philips HeartStart Onsite. Philips defibrillators are meant to be used by inexperienced responders under considerable stress. Calm, clear voice instructions are designed to help instill the confidence that's needed when treating a person in cardiac arrest. Simple to use, clear concise verbal coaching, always ready to use, self diagnostics testing, the most widely sold defibrillator in the world and made by a name you can trust PHILIPS. SAFERUN MSDS Right to Understand Center, Binder Steel Racks 3mm Thick Polystyrene Board with Coated Wire Basket. PetKa Signs and Graphics PKFO-0047-NA_10x7"Trespassers will be Violated" Aluminum Sign, 10" x 7"
Brady SM682A Heavy-Duty Poly, White On Blue Color Double Standard Operation Procedures Center, Legend"Standard Operating Procedures"
SCK105 Aluminum Digi-Day Electronic Safety Scoreboard,"BECAUSE SAFETY MATTERS - #### DAYS ACCIDENT FREE"
DOT Enforcement Essentials Manual - Your complete guide to surviving CSA, DOT audits and roadside inspections. - J. J. Keller & Associates, Inc.